XL Eclipse Day 10: Get Ready for the $1,000,000 GTD Main Event! On the final day of the 888poker XL Eclipse Series, there were four tournaments on the schedule to wrap up the 34-event series. Most of the attention went to the $1,000,000 Main Event, which had a buy-in of $1,050. This was the highlight on Day 11, but there were big winners in other events too. Let's see who took down the Main Event and the other events on this final day of the series. A total of 710 entries were gathered in XL Eclipse #32 - $1,000,000 Main Event. The tournament fell short of the guarantee with Roman "Romeopro33" Romanovskyi being the main benefactor as he took down the tournament for an outstanding $187,500 and was crowned the champion. The Ukranian had a heated and bad beat filled heads-up battle with Simon "Isildur1337x Mattsson, who was the chip leader for most of the final table. After a few chip lead changes between the two, it was Romeopro33 who would come out on top, sending Isildur1337x out in second place, getting a respectable $135,000 for his efforts. Many well-known 888poker ambassadors came to play the Main Event such as Chris "888Moorman" Moorman (247th Place), Dominik "888Dominik" Nitsche (118th Place), Sofia "sofialovgren" Lovgren (40th Place - $4,000), and fan favorite Parker "888tonkaaaa" Talbot (37th Place - $4,000). Once the late registration period had ended, there were 90 places being paid and around six hours into the day, on level 21, it was "pullztrigger" who would be dubbed the bubble boy. All of the remaining players were now guaranteed a min-cash of $2,600. The play, as per usual, opened up heavily after the bubble had popped and players dropped rapidly. The play tightened up once the tournament had reached five tables and it would not be until level 32 that the final table was set. The first person to make an exit on the final table was NumbeeerONE who lost almost all of his chips to Isildur1337x, running ace-queen into aces. It was just a few hands later that NumbeeerONE would take an exit when he moved all in with king-nine against the ace-king of wisimaki. A couple of hands after the first elimination of the final table it was Kamcumir finding himself fall victim to Isildur1337x, after pushing his nut flush draw all in against Isildur1337x's top pair of queens. Kamcumir failed to hit and was sent home in eighth place. varonislv grinded as long as he could before pushing his stack all in from the small blind with pocket tens and would have a caller in Isildur1337x, who was holding big slick. The flop came down in varonislv's favour, but a king on the turn would seal his fate as the next to exit from the tournament in seventh. It was just one level after the final table had started when Isildur1337x opened from the cutoff, wisimaki moved all in and Isildur1337x called. wisimaki had pocket fives against Isildur1337x's ten-seven. The flop came down with a ten, giving Isildur1337x the lead and he would keep it as the board ran out dry, eliminating wisimaki from the tournament in sixth place. The fifth-place finisher would be Felipe "mr.salgado" Salgado who pushed all in with ace-seven and found a call in nitGMmator holding ace-queen. The flop came down with a queen and the board ran out clean for Rafael "nitGMmator" Moraes , giving him the pot and eliminating mr.salgado from the tournament in fifth place. StuntSoHard would be the next to take an exit after he had moved all with a great hand in ace-jack, but was unfortunate to be called by Isildur1337x, who was holding ace-queen. The board did not improve StuntSoHard's hand and he was eliminated from the tournament in fourth. nitGMmator was waiting patiently, picking up nice pots when he needed to and making the correct folds. When he moved all in with his ace-queen, he found himself in a cooler situation, with Isildur1337x waking up with pocket aces. nitGMmator did not improve and would take an exit in third place. The heads-up match lasted almost three blind levels before someone was crowned the victor. Both players took turns as the chip leader until finally, it was Romeopro33 ending the tournament with none other than pocket aces, sending Isildur1337x out in second place. Romeopro33 grinded out the final few tables and did not really get very aggressive until play was down the final two. He let Isildur1337x do all the dirty work, eliminating almost the whole final table single-handedly. Once heads-up play began it was Romeopro33 who became the aggressor and after a couple of flips he would be the champion. 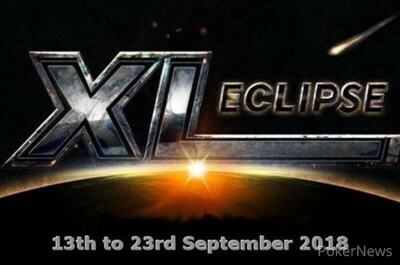 A total of 869 entries were compiled in the XL Eclipse #33 - $150,000 Mini Main Event. It took just over ten hours of play before the champion was crowned in TAPIS_TAPIR, who pocketed a cool $34,182 for his win. TAPIS_TAPIR ran over the final table with his aggressive play and would end the tournament in a short heads-up match with Malta's CraiEvryTime. The two would put it all in the middle just hands into play, on a race, TAPIS_TAPIR would be the benefactor of that race as he completed a straight on the river, eliminating CraiEvryTime, who took home $24,687 for his efforts. When late registration had ended, the tournament had a total of 117 players that would make the money and take home a min-cash of $380. It was just before the 22nd level of play that C_CANCEL would find himself heading out as the bubble boy. The tournament had a flurry of eliminations happen shortly after the bubble popped, it would be just three hours later that the final table was set. SemogrotciV would be the first to leave the final table when his pair of tens fell to the ace-queen of Marflon, SemogrotciV hit a set of tens on the river but the same card gave Marflon the nut flush, sending SemogrotciV home first from the final table. VinnyCout would fall out of the final table next, taking on a race with big slick against TAPIS_TAPIR's pair of sevens, but failed to connect with the board, being eliminated in eighth. TAPIS_TAPIR took down another player shortly after with his pocket fours against Vsekaknado and his ace-king. Vsekaknado failed to hit and TAPIS_TAPIR took down race and eliminated another opponent. TAPIS_TAPIR again found himself having an opponent all in on a race, this time it was SalsaFiesta taking a shot at TAPIS_TAPIR with his jacks. He failed to take down the pot, being eliminated to TAPIS_TAPIR's ace-queen after a queen hit the board. The fifth-place finisher was Diffusar, after he put his remaining chips all in with king-five against TAPIS_TAPIR's ace-seven, failing to hit anything and being eliminated. Marflon was yet another victim of TAPIS_TAPIR at the final table, losing with his ace-two against TAPIS_TAPIR's jack-queen, being eliminated in fourth place. AUTISPOSTI was in an optimal spot to double up after flopping top pair against his opponent, but TAPIS_TAPIR would end up finding runner-runner spades for a flush, eliminating AUTISPOSTI from the tournament in third. The final table was fierce and competitive, but it was TAPIS_TAPIR's sheer desire to win every hand that was the difference maker. He went for the win at every moment, managing to eliminate almost every player at the final table and secure the win. The first event of the day started 90 minutes before the Main Event and the XL Eclipse #31 - $100,000 Mega Deep attracted a field of 735 players. They were all chasing the first place prize of $27,930 while every finalist would receive a minimum of $2,940. The final four players making it a five-figure score. In the end, "dschroeder17" finished in fourth place, receiving the prize of $11,025. Before the final heads-up, "NoMamesWeyyy" got eliminated in third place for $15,082. The deciding battle for the victory was won by Sweden's "cuadrado12", who defeated "nnnn_." The runner-up received $20,580 while the winner got $27,930 in his or her account. It was his second victory of the XL Eclipse Series, so the Swede received another $1,000 bonus from 888poker. The smallest of the events to start on the last day of the 888poker XL Series, had a buy-in of just $33. The $50,000 888poker guaranteed was easily surpassed as a massive turnout of 1,363 gathered to create a prize pool of $70,890. Germany's "amverskltn97" took down the event for an $11,974 score after defeating Malta's "shadinho888" in the final heads-up.